"Love Story" is first book in the Family Baxter series. 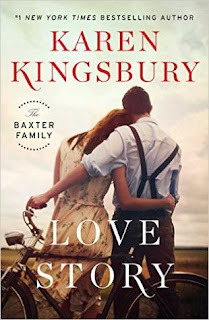 While Karen Kingsbury has written about the Baxter family in several other books and series, this is the first "Family Series Book." If you love the Baxter family, you'll love love this book and you'll be thankful to have read it. This book can be read as a stand alone, so you don't need to read the entire series, but it sure does give some much details to the Baxter family that we've been longing for! Fans of Kingbury will be turning the pages and will have this book read from start to finish in one evening. Karen has this way of taking the past and weaving a beautiful story with the future. You'll be moved from tears as you read the story of John and Elizabeth. You'll rejoice with Andi and Cody, despite their complications, the journey and the frustration the two go through! You'll be cheering for Andi and Cody the entire time and even some swoon worthy moments. This book is full of emotions, depth, the present, the past and the famous Baxter family! Order this prequel !! You will love this new angle to the family story! I give this book 5/5 stars. I read this book in one sitting and the pages were flying! Thank you to publisher for providing me a complimentary copy for review purposes. A favorable review was not required. I look forward to Karen's next book that is coming out, which is entitled "In This Moment." Make sure you pre-order another amazing book! I hope to have a review to you soon! 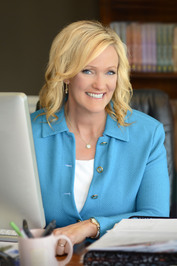 Karen Kingsbury, #1 New York Times bestselling novelist, is America’s favorite inspirational storyteller, with more than twenty-five million copies of her award-winning books in print. Her last dozen titles have topped bestseller lists and many of her novels are under development with Hallmark Films and as major motion pictures. In addition, it was recently announced that Roma Downey and MGM Studios are developing a TV series out of Karen's popular Baxter Family books. Karen is also a visiting professor at Liberty University. Karen lives in Tennessee with her husband, Don, and their five sons, three of whom are adopted from Haiti. Their actress daughter, Kelsey, lives nearby and is married to Christian recording artist Kyle Kupecky. The couple recently welcomed their first child, Hudson, making Karen and Don grandparents for the first time.